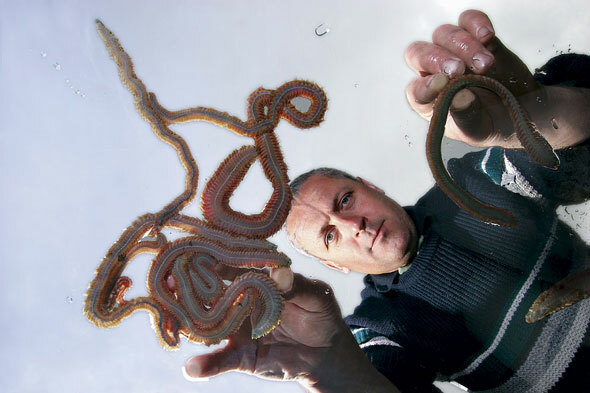 Ragworms come from a large family of phylum annelids, many of which are polychaetes, or bristle worms. 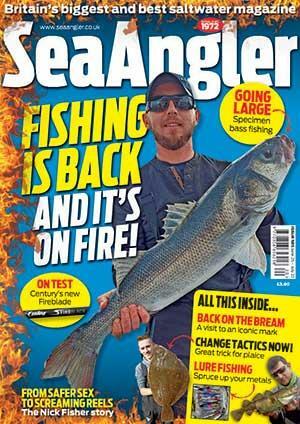 Now you know that let’s identify the ones that are important to sea anglers. Here we are going to focus our attention on red ragworms, as opposed to the whites and others that anglers will come across. Biggest worm in the range is the spectacular king rag (nereis virens), the common red rag, (nereis diversicolor), and the harbour rag, (hediste diversicolor). Starting with the biggest, king rag are usually about 30cm long but are known to reach up to a metre in length. If you look carefully at the head of the king rag you should be able to make out two pairs of eyes and four pairs of antennae. Anglers are more concerned about the reversible proboscis containing a very impressive set of pincers, which can give you a sharp nip if you are not careful. King rag are loners and it's rare to find concentrated colonies of the really bigger specimens. The common red rag grows to around 15cm and is more likely to be found in reasonably dense colonies in harbours and estuaries. These are the worms that are stocked by most tackle shops. Harbour rag, also known as maddies or wrigglers, grow to around 8cm and are nearly always found in dense colonies. This worm lives in a vertical burrow and can reach quite high densities in sheltered estuaries where conditions are usually unsuitable for other species. It is easily identified by a red dorsal blood vein, which runs down the centre of its body. It is an important food source for many species of estuarine wading birds. Reproduction depends on the species. In most species the sexes are separate but there are a few that are both male and female (hermaphrodite). When they spawn the males change to a light green and the females to a dark bottle green. The ragworm is both a scavenger and an efficient predator feeding on mud, detritus and plankton. When in hunting mode it can rapidly shoot out its powerful jaws to catch other softbodied animals. They all inhabit much the same type of ground in sheltered harbours and estuaries and favour broken muddy and sandy ground. They can also be found close to mussel beds and in some cases the king rag will live in very rocky ground where it is relatively protected and where it can grow to a very large size. Why not collect your own worms? With a bit of planning you can gather your own ragworms for bait, but first you have to identify a broken muddy or sandy location where the ground is reasonably firm and well exposed during a big low tide. Be careful in harbours where the mud can be thick black and oozy. If you wear Wellington boots you will get stuck and even wearing waders doesn't mean you are safe from getting bogged down. Search for rocks and stones, turning them over to find the holes and channels the worms make. If you are careful, quiet and turn the stone over quickly you should be able to grab the odd ragworm in your hand before it disappears down its burrow. After turning over the rocks to find some tell-tale holes you should dig. If the ground is hard try a flat-tined potato fork that also offers less chance of cutting the worm in half. Harbour rag can usually be found in the top 30cm of the ground and the bigger worms will be a bit deeper, up to 70cm in some cases. If there are lots of worms dig trench style working back along the trench to expose any worms. Normally it is necessary to have a good look around, find a suitable small area of ground before digging and then moving onto another spot. Surface water often runs into the hole if the ground is very soft. If this happens use a spade using a small bucket to bale out the water. You can dig a lot deeper and quicker with a spade. Your tools must be strong because they will be used as a lever just as much as a digging implement. When exposing a worm try to lift it out of the hole with the next dig rather than trying to pull it out, which can break the worm. Try to vary where you dig as well. On big tides start at the furthest exposed point and leave the top of the beach for smaller tides. You might find that the worms are easier to gather by digging right on the edge of the ebbing tide when the ground is still wet and the worms have yet to move deeper. Worms seem to know when the tide is flooding and move upwards in anticipation of a supply of fresh seawater, in which case try digging right on the edge of the water line. Warm weather usually brings the worms up to the surface, and very cold frosty weather will drive the worms a lot deeper in the mud. Big king rag are dug individually. Foot pressure can often result in a spurt of water coming out of a hole and sometimes you will find bits of seaweed, that the worm has tried to take, sticking out of a hole. Dig a small trench at the side of its burrow and then try to follow the hole as it twists and turns down through the ground. This is hard work but can produce some massive worms once you know what to look out for. When you have enough bait wash off your tools and then fill your main container with fresh seawater, rinsing the worms out thoroughly. Separate the broken ones into your smaller baling bucket, which then fits inside the bigger bucket. If you leave whole and broken worms in the same container the water will quickly turn orange and on a warm day in a car boot the worms will die. Back home the whole worms go into a bucket of clean seawater aerated by an air pump for a few hours; this gives the worms time to expel any mud that is still in their system. Missed broken worms go into a separate shallow tray with containing a few millimetres of water, while whole worms that may be damaged go into a different tray. The good quality hole worms go into other trays all covered by a few millimetres of water. All the worms are stored in a fridge, which not only keeps them cool but also in the dark. Change the water twice a day to keep your worms healthy. ● When you go fishing keep bait parcels of newspaper, which helps to toughen them up, in a large bucket. If it's a hot day put a small freezer block in the bucket. ● The size of the worms can make a difference to results. Small worms are more effective for catching small fish, large worms are best for specimen fish. Ask your tackle dealer for the size you need or request a mix of sizes. ● Can't face handling a ragworm because of their pincers? Cut off the head with your scissors. ● Cocktail baits are deadly for lots of species. There are no rules that say you cannot mix two, three or more baits. Beware of masking the hook point though and use a hook size that suits the size of the bait. ● An excellent guide to what hook to use is to match the size and pattern to the bait being used. Long-shank hooks in size 1/0, 1 and 2 are best for worms and sandeels. Use short-shank hooks up to 3/0 for crabs and fish, with mediumshank hooks in size 6/0 suited to squid and live fish. ● Keep your bait out of the wind, rain and sun and it will retain its freshness longer. A cool box is as useful in the winter as in summer to keep bait fresh and alive.